Get more with your ADIB Rewards program. Points earned can be used towards airline tickets and shopping mall vouchers. Earn 2.5 reward points for 1 AED you spend on your card. Whether it is for a cup of coffee or for some fine dining, get 10% cashback in the UAE when you pay using your ADIB Edge Card. Enjoy complimentary round of golf (subject to availibility) once a month at the Arabian Ranches Golf Club, Dubai. Simply call 600 543216 to book your session. 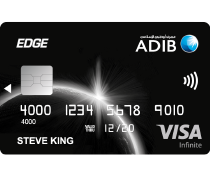 Show your ADIB Edge Card at select locations in the UAE and get the stress of finding a parking off your hands! You and a travelling companion can get access to over 1,000 airport lounges across the globe at no cost to you by presenting your ADIB Edge Card. (1)To register for LoungeKey benefits and more information please visit https://www.loungekey.com/visainfinitemena. Customers are eligible for a refund up to USD 7,500 per item if purchases are accidentally broken, stolen, or damaged, within 365 days from date of purchase. Manufacturer or retailer’s warranty will be automatically extended on a range of goods for a combined total of 24 months. ​ ​ADIB Online Banking – visit adib.ae to view and transact on your ADIB Edge Card. (1) The USD 1 transaction spend can take up to 15 days to reflect on the VISA system. (1) Qualification criterion has to be fulfilled at the time of the visit to the lounge. (1) Qualification criteria applies also towards supplementary card. (11) No annual fee for Diamond customers in relation to the Principal Card of this card type. (12) 2.75% for Diamond customers of this card type. (13) Free for Diamond customers of this card type. (14) AED750 for Diamond customers of this card type.